You can also get a matching scarf, ski cap, and sweater. 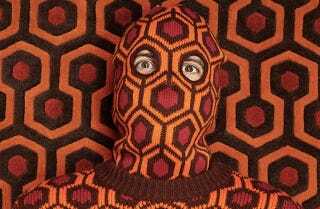 The folks at Mondo are coming out with an entire collection of gear inspired by the mesmerizing pattern on the carpet from The Shining's Overlook Hotel. You can preorder your Overlook doormat, cardigan, or area rug now and give anyone who gazes upon them a vague sense of unease.